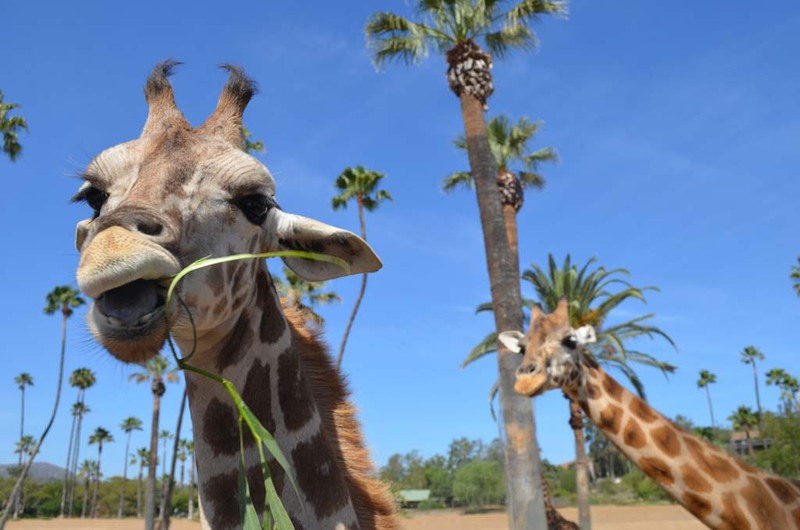 ESCONDIDO — The two giraffe approached the truck seemingly without a worry as Amanda Lussier, an animal keeper at the San Diego Zoo’s Safari Park extended a large Acacia branch out and over the truck’s railing. One of the giraffe quickly latched onto the branch with its large blue tongue and proceeded to pull it into its mouth, contorting its lips around the leaves. The second giraffe followed suit, with some of the park’s 14 other giraffe coming over, lowering their long necks down into the truck’s flatbed to see what food might be available. That was an entirely different experience than what David O’Connor, a conservation education division consultant with San Diego Zoo Global Institute for Conservation Research, found while studying giraffe in the East African country of Kenya. For six months near the area of Laikipia, O’Connor would have to overcome certain challenges while trying to observe giraffe in the wild — at times being forced to observe them from distances anywhere from 200 meters to 500 meters away. It took him a month, he said, just to get the giraffe used to seeing his truck. Other times, the giraffe wouldn’t do anything but stare at him for several hours on end, making it difficult to make any behavioral observations. They’re really a popular species, but nobody’s really spent much time studying them, he said. What they know a lot about is their physiology — what isn’t so well known is how they live in the wild, and how they live with humans and how giraffe and humans interact, O’Connor added. What he did note, however, was the skittishness of the giraffe in the wild as the result of falling prey to poachers. “The main challenges facing giraffe are most recently poaching,” O’Connor said. “And they’re poached for several reasons: one reason is for meat, for food. Unfortunately, in the wild, giraffe are quite easy to kill,” he said. “Because sometimes initially they’ll just stop and stare at you, so one bullet can take them out, as opposed to an elephant or something where it’s harder. And you get quite a lot of meat for that one bullet…. While O’Connor said that the numbers on certain species, such as the Reticulated giraffe are uncertain, researchers think they’ve declined from about 28,000 in the year 2000 to about 5,000 today. “So if that trend continues, that subspecies will be extinct by 2019,” O’Connor said. That’s why now, working with the institute, O’Connor and others are trying to start a program addressing giraffe conservation. What initially brought O’Connor to study giraffe was his interest in how they were able to coexist with cattle and goats, especially as it pertained to food sources. Giraffe feed up so high, O’Connor explained, adding that cattle and goats feed so low that their food sources don’t overlap. Yet, he found that there was a shift in how people were relying on the traditional livelihood of pastoralism. “And that is where pastoralists keep cattle and goats and everyday they’ll take them out into the wild for grazing,” he said. But they’re now switching to camels as a new livestock species, perhaps, he said, because of climate chaos and other reasons. That’s something they’ve never done before, O’Connor said, but noting that camel milk is now becoming a new health trend. And the camels will eat anything — they’ll move through an area leaving the whole of the vegetation denuded, and with camels being so big they can get into that zone of the giraffe. Most worrying, O’Connor said, was a myth being perpetuated, which said that eating giraffe brains or bone marrow could protect people from HIV and AIDS. “So they’re being slaughtered for that reason, and it’s completely ineffectual,” he added. The giraffe conservation program is hoped to be in place over the next 12 months. Some of the ongoing conservation efforts include working with the communities that overlap with giraffe. One of their main goals for helping to implement conservation efforts with those communities is not to be viewed as outsiders. “We can’t just say, ‘Stop killing giraffe,’ or, ‘Stop using the wood in the forest,’ without giving them an alternative,” he said. It’s about building relationships with the communities and with the herders, which usually entails going out on walks with them, understanding what their perceptions of the animals are.